Today I want to explain the basic components and the set-up of VMware NSX. In this case I’m referring to NSX for vSphere or NSX-V for short. I want to explain what components are involved, how you set them up for an initial deployment and what the requirements are. At time of this writing the latest release is NSX 6.1.4. This version added support for vSphere 6, although you cannot use any vSphere 6 feature in this release, there is support for the platform itself only. The first step is of course deploy your ESXi vSphere cluster with ESXi 5.5 or 6.0 with vCenter 5.5 or 6.0. I recommend using the vCenter Server Appliance (VCSA) instead of the Windows version. You will also need a Windows VM where the vSphere Update Manager is installed, this is not available as virtual appliance, only as Windows application. I also highly recommend installing an Active Directory server to manage all of your passwords. You will be installing a large amount of machines with all different usernames and possibly passwords. I recommend picking a very long and difficult one, as all VMware appliances seem to require a different password complexity. After deploying the initial cluster it’s also essential to deploy a Distributed vSwitch across the nodes where you will be deploying virtual networks. For this feature you will need the Enterprise license (or the trial will suffice) when running ESXi 5.5 Update 3 and NSX (before that Enterprise Plus was required). The only component you download is the NSX Manager. This OVA file contains everything you will need for deploying NSX. After deploying the OVA through vCenter you are able to log-in to the Web GUI of the NSX Manager. The only setting available is connecting to the vSphere Single Sign-On server and to vCenter. When deploying all components make sure you set NTP servers for everything in the lab. There are many integrations and they all rely on authentication that also takes time into consideration. After connecting the NSX Manager you will no longer need it that GUI. Within the vSphere Web Client a “Networking & Security” tab is now available. The next step is to deploy at least 3 NSX Controllers in the cluster. This is automatically done by the Manager after filling in required information. You need 3 for redundancy as the cluster will select a master controller, which is done by using a majority number (quorum). With only 2 nodes, there is no majority and therefore at least 3 are required for redundancy (think of RAID with Parity disks). The controller is the critical piece of the software. Here all ARP requests are handled and all information is shared with the ESXi hosts. The Controller will also take care of multicast replication when the unicast mode is chosen for transport. The following step is to install 3 kernel modules in all hosts. This is done using the VMware Update Manager (the Windows application) and just a single click in the GUI. It will install the NSX module to communicate with the controllers, the Distributed Logical Router (DLR) and the Distributed Firewall. No configuration is necessary as all changes are pushed by the controllers. To get traffic to and from the virtual environment you will require an NSX Edge today, as soon as OVSDB is available this could be your MX router as well! The NSX Edge has 2 forms, the first is the Distributed Logical Router that offers basic routing, bridging and firewall features. The second version is a VM that traffic is hair pinned through, like a software router. The second version also offers VPN and Load Balancing features. To support the VXLAN transport, the hosts need to get an IP address to use as source address. This can be assigned using DHCP or an IP Pool, more on this in a next blog! Next a Segment ID pool needs to be created to allocate VNI’s for the virtual networks (called logical switches). Today it’s not supported to have more than 4000 segments on NSX, which combines the regular port groups and NSX port groups on the distributed vSwitch. The final step is to create a transport zone. This defines a “data center” or a “site” where NSX runs. This limits the broadcast domain. Per transport zone you are able to select wether the NSX Controller should handle multicast replication (Unicast mode) or that the network should handle this (Multicast or Hybrid mode). The recommended choice is Unicast mode so you won’t require multicast routing protocols or IGMP from the network. VMware eliminates the need for smart network hardware even further with this, but the solutions runs best with optimized hardware of course running as IP CLOS Fabric offering “Layer 2 as a service” using network virtualization. Now the deployment is ready to have the first VXLAN segments created, which are called Logical Switches. These networks are created as distributed port groups, so you can use the standard tools to connect VM’s to these virtual networks and suddenly you are using VXLAN transport! I hope this article gave you some insight in how NSX is configured and what components it consists of. In my last blog I explained the features and use cases of the EVPN technology. In this blog I want to show how easy it is to configure, enable and expand EVPN. The configuration is focused on the Juniper MX platform, but as Junos is the single operating system across the entire Juniper portfolio, configuration on other platforms (like EX9200) is equal. The topology is really simple. I’m using 2 routers in this example, so multi-homing is not in scope. Each router has an Ethernet segment connected that consists of multiple VLANs on each side. There is 1 VLAN ID that is not equal on both sides, so this has to be taken care of. To make sure we can start creating our VPN, we have to ensure the foundation is in place. This means we need IP reachability to the other Data Center routers loopback address and we need BGP with the EVPN address family enabled. The Junos release I’m testing with needs a special knob to be enabled to ensure packet lookups are done in the right way. Other versions will see this knob disappear as it is default moving forward. Interface ge-0/0/1 is the one connected to the MPLS network and we configured an iBGP neighbor for both the Layer 3 VPN and EVPN address families to exchange layer 2 and layer 3 routes with each other. We use OSPF as internal routing protocol, but in this simple topology it could’ve been a static route as well. There are 2 options to configure EVPN. The first option is to configure a separate EVPN Instance or EVI for each VLAN/Bridge-Domain. This brings the best separation of traffic, MAC address advertisements and give full control over flooding of broadcast traffic on a per VLAN/Bridge-Domain basis. The VLAN ID of traffic that is sent between the 2 PE routers will be set to 0. 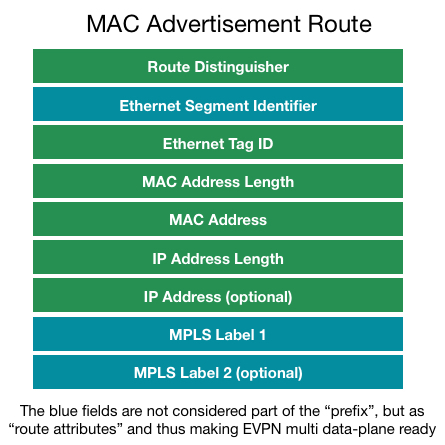 A Route-Target and Route Distinguisher is created for each EVI and therefore each VLAN has it’s own MPLS Label. This could potentially cause scaling issues, as PE routers have a limit on the number of VPNs that can be configured. The following is an example of the configuration for our topology. The commands “flexible-ethernet-services” and “flexible-vlan-tagging” on the interface allow us to use this interface for a variety of services. This means we can use single or double-tagged interfaces and we can configure both layer 2 bridging as layer 3 sub-interfaces on this single physical interface. One of the very strong features of the MX platform! As you can see the VPN configuration is very easy! We just make sure the right interface is in the VPN and we assign a RD and RT value to it and we’re done! As we have a single-homed scenario, there is no configuration necessary. The ESI (as discussed in my previous blog) is by default set to 0 on single-homed routers and doesn’t have to be different on the other end, because of the single-home setting, which is enabled by default. The second option is more flexible to use. This is the VLAN Aware service. This option allows multiple VLANs and Bridge-Domains to cross a single EVPN Instance (EVI). This improves scaling and still allows for proper separation. The VLAN ID is now encapsulated in the packet. 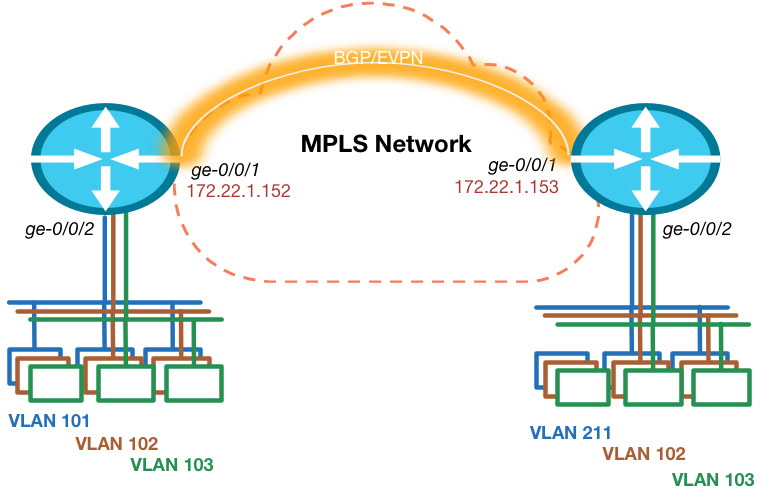 To ensure proper ECMP forwarding in the MPLS network an MPLS label is assigned per VLAN ID, so that traffic will be load balanced per VLAN and not per EVI. The configuration for this service is a bit more complicated, but still fairly simple and also still allows for VLAN translation! Even MAC address overlap is allowed within this service between different VLANs/Bridge-Domains. As you can see we also ensure the VLAN translation is taken care of. We could use VLAN normalization in this case, which means we use a different “unique” VLAN ID within the EVPN service and use VLAN translation on each side to ensure the local side has the right encapsulation. This blog showed you how easy and how flexible EVPN configuration on Junos is and how fast we can set-up a optimal Layer 2 Data Center Interconnect. In the following blogs I will discuss multi-homing and Layer 3 integration to ensure all-active routing across Data Centers. EVPN or Ethernet VPN is a new standard that has finally been given an RFC number. Many vendors are already working on implementing this standard since the early draft versions and even before that Juniper already used the same technology in it’s Qfabric product. RFC 7432 was previously known as: draft-ietf-l2vpn-evpn. The day I started at Juniper I saw the power of the EVPN technology which was already released in the MX and EX9200 product lines. I enabled the first customers in my region (Netherlands) to use it in their production environment. EVPN is initially targeted as Data Center Interconnect technology, but is now deployed within Data Center Fabric networks as well to use within a DC. In this blog I will explain why to use it, how the features work and finally which Juniper products support it. Most options also only work well in a point to point configuration (2 data centers) like Dark Fiber or xWDM circuits or only with a few locations/sites (VPLS). Only the proprietary solutions have a control-plane that controls the learning and distribution of MAC addresses. All others are technically just really long Ethernet cables that interconnect multiple Data Centers. Now why is that so dangerous? I’ve had numerous customers with complete Data Center outages because of this fact. No matter which solution you pick that does not offer a control-plane for the MAC learning, when problems occur in one DC like ARP flooding or other traffic floods. They will propagated to the other DC as well using the interconnection layer that can only protect it with features like storm-control, etc. This means that impact on Layer 2 in DC1 impacts other Data Centers. Where in most cases the other Data Center is in place because of high availability reasons. EVPN is technically just another address family in Multi Protocol (MP) BGP. This new address family allows MAC addresses to be treated as routes in the BGP table. The entry can contain just a MAC address or an IP address + MAC address (ARP entry). This can all be combined with or without a VLAN tag as well. The format of this advertisement is shown in the drawing. Now the immediate benefit of using BGP for this case, is that we know how well the BGP protocol scales. We won’t have any problems learning hundreds of thousands of MAC entries in the BGP table. The second benefit is that we now have MAC addresses as routing entries in our routing table and we can make forwarding decisions based on that. This means we can use multiple active paths between data centers and don’t have to block all but 1 link (which is the case in all the previously mentioned DCI technologies). The only traffic that is limited to 1 link is so-called BUM traffic (Broadcast, Unknown unicast and Multicast). For BUM traffic a Designated Forwarder (DF) is assigned per EVPN instance. This technology is not new and is also found in protocols related to TRILL and other proprietary technologies. ARP traffic will be treated in a different way than regular Layer 2 interconnects will do. First of all Proxy-ARP is enabled when EVPN is enabled on an interface. The Edge gateway of the DC will respond to all ARP requests when it knows the answer to them. This immediately implies a very important rule. When an ARP request is done to an IP address the Edge router doesn’t know or when traffic is received with a Destination MAC that is unknown, the Edge gateway will drop this traffic! This limits unknown unicast flooding immediately to only a single DC, which is quite often a cause of issues. The Edge Gateway has to learn about a MAC or ARP entry from the Edge gateway in the other DC before it will allow traffic to pass. We obviously want 2 gateway devices at the edge of our Data Center. Therefore we have to support a multi-homing scenario. EVPN allows for an all-active multi-homing scenario as previously explained, because of the routing nature. Besides this we need to limit the flooding of traffic, which is the reason why we choose a Designated Forwarder per instance which is responsible for receiving and sending BUM traffic. We also support split-horizon, to prevent that traffic originating from our own Data Center does not get back in through the other Edge Gateway. This is done using the ESI field in the advertisement. An ESI is an identification for a certain “Data Center Site”. Both gateways in a single Data Center should use the same ESI number, to prevent traffic getting looped back in. Other Data Centers should use a different ESI number. This means that each Data Center will have 1 ESI number. The EVPN feature is designed for extremely fast convergence. Another big issue within Data Center is what’s called MAC flapping and mobility. This means that when a Virtual Machine moves with it’s MAC address, the MAC needs to be re-learned within the network and the old entry should be deleted. Within a single layer 2 switch domain this happens quite fast, which is also the cause of issues, when a duplicate MAC address is found in the network. Then the same entry is learnt on two different ports causing “MAC Flapping”. EVPN solves this by introducing a counter when a MAC moves between Data Center locations. When this happens too often in a certain time period (default 5 times in 180 seconds) the MAC will be suppressed until a retry timer expires to try again. The benefit of the MAC sequence numbering is that when the Edge Gateways see an advertisement for a MAC address with a higher sequence number they will immediately withdraw the older entry, which benefits convergence time after a VM move. The last benefit I want to highlight is that, because the Edge Gateway is fully aware where hosts are located in the network, it can make the best Layer 3 forwarding decision as well. This means that Default Gateways are active on all edge gateways in all data centers. The routing decision can be taken on Layer 2 or on Layer 3, because the edge gateway is fully aware of ARP entries . Currently there is 1 standard and 2 proposals that all rely on the same control-plane technology (EVPN). The first is the current standard RFC7432 which is EVPN with MPLS as it’s data-plane. The second proposal is EVPN-VXLAN, where the same control-plane is used, but the data-plane is now either VXLAN or another Overlay technology. The third proposal is to use PBB encapsulation over an EVPN control-plane with MPLS as data-plane. Finally I want to discuss which products support this technology and how you can implement it. Juniper currently implements RFC 7432 (EVPN-MPLS) on it’s MX product line, ranging from MX5 to MX2020 and on the EX9200 series switches. The EVPN-MPLS feature is designed to be used as Data Center Interconnect. Since the MX has full programmable chips Juniper also implements several overlay technologies like VXLAN. This means we can stitch a VXLAN network, Ethernet bridge domains, L2 pseudo wires and L3 VPN (IRB interface) all together in a single EVPN instance. All this means we have a swiss army knife full of tools to use within our Data Center and we can interconnect various network overlays and multiple data centers together using a single abstraction layer called: EVPN! In my next blog I will demonstrate the use of EVPN on the MX platform and how easy it is to implement an optimal Data Center Interconnect!